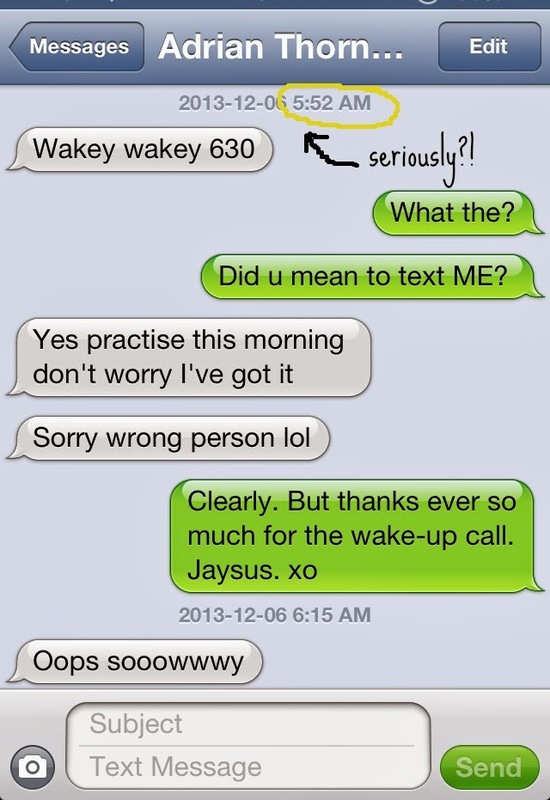 I was woken up today at 5:52 AM by my phone buzzing—an incoming text from my husband. For some reason he needed me up at 6:30. I wracked my sleepy brain. Did I ask him to wake me for some appointment that had temporarily slipped my mind? No reply. I started to worry. Was he okay? Why wasn’t he answering? Then it dawned on me that he mis-texted. I can’t really make fun of him (but I will) for mis-texting. I do it a lot. Recently I texted my sister-in-law several dog photos. She wrote back and asked me to stop. Surely she was joking. I texted more dog photos. “You have the wrong number.” She replied. Haha! She’s such a kidder. Have you seen Buzzfeed’s “27 Ways To Response To A Wrong Number Text?” You gotta love people who take the time for antics like these in the quest for a good chuckle. My favourite is this one. Kind of blurry and possibly a little “catty” but hysterical. Read the rest of these texts gone wrong here. How Could I Forget This Family Photo? Funny But Not Funny I Ruffled A Few Feathers Happy Disability Day?